Have you wanted to purchase fresh, nutrient dense, delicious grass fed meat raised by someone you know & trust but been hesitant to do so because you don’t think you can manage it for one reason or another? Have you been intimated about the size of the freezer you’d need? Or are you concerned the meat won’t keep well? Or that you’d never be able to eat it all up? Foggy Knob Farm whole and half lambs are a reasonable amount of meat for 1-3 people. Unlike purchasing Grass Fed Beef in bulk, Foggy Knob Farm’s Grass Fed Lamb halves finish out at about 16 pounds of finished cuts. A whole lamb? Approximately 30 lbs. 2. I don’t have a deep freeze. Live in an apartment? Downsized to a condo? No problem! No Deep Freeze Required! You can fit an entire lamb onto 2 shelves in a standard side-by-side kitchen freezer. A half lamb fits on just 1 standard freezer shelf! 3. We travel a lot. The meat will go bad before We can eat it all. All our Foggy Knob Farm Grass Fed Lamb cuts come wrapped in coated paper and will last at least 12 months in the freezer with no change in quality or flavor. I’ve even had packages of lamb get buried (I hate to admit it but sometimes for a year or two!) in my freezer and they have been perfect. Purchasing meat in bulk is certainly a mind shift. You have to plan ahead a bit. But it is not expensive! A year’s worth lamb for one person costs about $16/month. Lamb for 2-3 people? $30/month. 5. We don’t eat a lot of meat. Nice thing about lamb, the cuts are small when compared to other meats, typically 4-6 ounces per serving. You can pull out a couple of lamb rib chops and have the perfect sized portion for just you and your spouse. A package of ground lamb, perfect for lamb burgers on the grill, will provide 4 quarter pounders, a mere 4 ounces of luscious lamb. That’s supper with leftovers for lunch the next day. 6. I don’t cook much. No problem! It doesn’t take much to cook lamb. Most cuts can be thawed, prepped, and cooked in an hour. So there, now you have no excuses! Foggy Knob Farm’s whole or half lambs are perfect for you! 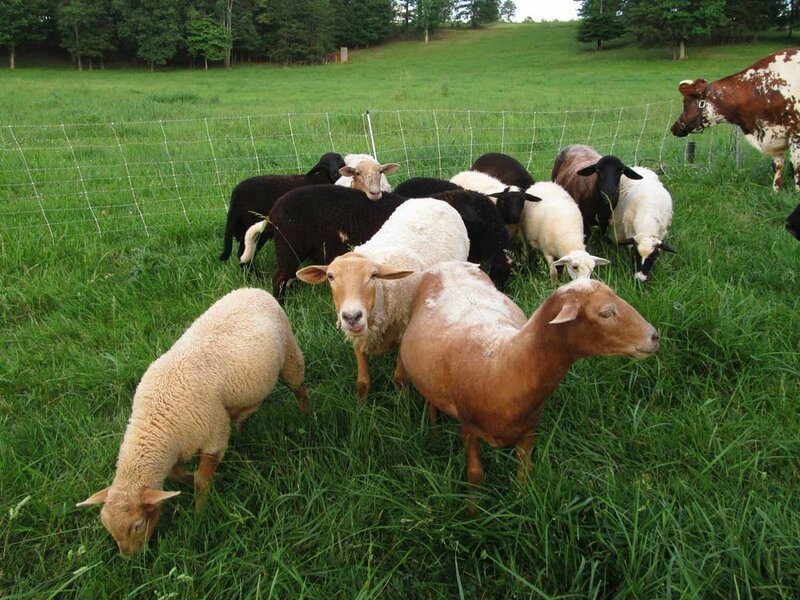 If you haven’t had a chance, click on the link below and order your Foggy Knob Farm 100% Grass Fed Lamb today! This is the third and final post on Lamb Soups for Autumn. The first two recipes can be found here and here. I discovered this Lamb Soup recipe in a grass fed meat cookbook I received in trade from a friend. It is titled The Grassfed Gourmet and it is my most used cookbook. It is filled with many practical recipes. You can see how much I use it in this picture. The edges are pretty ragged. In this cookbook, I found a recipe for Pepper Soup. It can be mild or spicy, and like many of the soups I make, you can use whatever ingredients you have on hand to make it. This is another Lamb Soup recipe with curry powder as a seasoning. Curry powder contains turmeric, a spice known for it's anti inflammatory properties. It works best when it is eaten with some fat, something that lamb has in abundance. Coupled with the gelatin in the broth from all those wonderful lamb bones, this soup will soothe and support your achy joints. Instead of using lamb stew meat, as the original recipe does, I again use the same Lamb Broth with the bits of meat picked off the bones. This makes it a more economical soup and stretches the use of my lamb bones even further. Another bonus with this Pepper Soup recipe is it cooks up in 40 minutes, if you already have the broth simmering away. I often make this at the last minute if I have been working out in the pastures and need something warm and satisfying fast. 4-6 potatoes,cubed. Waxy varieties work best but any will do. I used Kennebecs. 2 cups chopped peppers, hot or mild and any color you like. I used red, ripe sweet banana peppers here. Add lamb broth, potatoes, tomato paste, thyme, and curry powder. Bring to a boil then simmer until potatoes are cooked through, approximately 20-30 minutes. Add chopped peppers and simmer for 5 more minutes. You could add sweet corn, green beans, spinach, sweet potatoes, carrots, really anything you have on hand goes well with the flavors of this soup. Three easy, rich Autumn Lamb Soups made from the same batch of lamb bones. Ready to try your hand at lamb yet? Be sure you are signed up for our email updates so you are the first to know when our 2018 lambs will be available. Click the button below this post to sign up and get more fabulous Lamb Recipes, right to your inbox! This is the second in a three part series on my favorite lamb soups. You can read the first part here. When I was a kid, my mother made a thick barley soup with homemade toasted croutons. The combination of the soft, tomato-y soup with the crunchy savory croutons was one I never forgot. My mom kept her recipes on index cards held together with metal rings and a brown luan cover that said “recipes”. Most of the recipes were handwritten by my mother directly on the cards or cut from magazines and taped on. Of course, scotch tape turns yellow and brittle after a few decades and hole punched index cards inevitably tear. When mom passed away, my favorite sister, Linne, took mom’s little brown index card recipe “book” and turned it into a beautiful keepsake cookbook made from handmade paper. She gave it to me for Christmas that year. It was 1999. My oldest, Celia, was just a baby. Thumbing through the pages, I came across mom’s barley soup recipe, complete with crouton making instructions! I had to make it! Finding soup bones proved to be a bit of a challenge. But I managed to find some and made this wonderful soup for my family. My mom always made this recipe with beef bones. After we started raising lamb, I began using lamb bones instead of beef bones because I had plenty of them in my freezer. I suppose grass fed lamb bones weren’t easy to find back in the 70s. Of course, now you can get grass fed lamb, complete with the bones, from us. This recipe takes about 90 minutes to prep and cook, assuming you have the broth already made. (1) 28 oz can tomatoes, chopped, pureed, or crushed, depending on what you prefer. I used crushed. 2 cups green beans or sweet peas, frozen or fresh, my mom always used peas. In a 6 quart pot, place lamb broth, barley, onion, black pepper, thyme, and oregano. Bring to a boil then turn down and simmer, covered, for 1 hour. Add tomato and carrots (or other orange veggies) and simmer for 20 minutes. Add sweet corn and green beans or peas. Simmer for 10 minutes if frozen, 5 minutes if fresh or canned. Several slices of bread. I use our No Knead Sourdough bread. Cube bread and place it in a bowl. Melt ghee or butter in a small saucepan. Pour over your cubed bread and toss to coat them. Melt more ghee or butter if they are not well coated and repeat. Sprinkle bread cubes with salt, spices, and optional cheese. Spread in a single layer on a baking pan and bake for 15-20 minutes, until bread cubes are crisp. Now to be honest, I rarely make the croutons and serve this with crusty bread and butter. It is less stressful that way. So don’t skip this wonderful soup because you don’t have time for the croutons. They are really good though! As an aside, my father claims that mom got this recipe off the side of the box the barley came in. Well, it’s my recipe now! And I hope yours too. This is the second soup I have made from the same batch of lamb bone broth. I’ve just pulled the broth off, added more water, and kept it all simmering. Ready for my next rich lamb soup recipe? Be sure you are signed up for our emails! Click on the button below this post to sign up and get my FREE Guide too. This is the first part in a series of lamb soup recipes I want to share with you. In my last post, I shared with you how I make my lamb broth. I love to sip on broth, but I also use it as a base for many delicious lamb soups. Soups are one of my favorite cool weather meals. They warm and nourish a body on chilly Autumn days. The flavor of lamb lends itself well to rich warm spices like ginger, garlic, curry, and chilies. When you use broth to make soup, it has the benefit of stretching protein, making a smaller amount of meat go further. As I have a lot of mouths to feed, this is a huge benefit for me. I can use the bits of meat off lamb soup bones, a couple of lamb shanks, or even leftover leg of lamb, combine it with lamb broth, veggies, frozen or in season, and sometimes some legumes, and feed my large family. If your family is smaller, freeze the extras and have soup for 2 or 3 meals. This recipe is one of my fall staples. It takes about 90 minutes to prep & cook, most of which you can spend curled up with a cup of hot tea while the leaves change color and the soup simmers! This is a thick, hearty soup, packed with spicy flavors and fall veggies. Any fine grained winter squash like butternut or pumpkin works well in this soup. Sweet potato is another option if you want a sweeter flavor. Feel free to substitute whatever leafy greens you like, keeping in mind that anything in the cabbage family, like kale or mustard greens, will lend a stronger flavor. Swiss Chard is a mild alternative if spinach is not available. Sometimes I save the meat for another recipe and serve this sans. It's still packed with plenty of lamb flavor and protein with the lentils & broth. Add garlic, ginger, curry, cumin & coriander to the onion & garlic and saute for 2-3 minutes to activate the flavors of the spices. Add lentils and stir to coat with the onion and spices. Add 10 cups of lamb broth. Heat to boiling then turn heat down, cover, and simmer for 30 minutes. Add the meat & cubed winter squash. Simmer for 30 minutes. Add salt and spinach. Simmer for 5 more minutes. Serve this soup alone or with a side of crusty sourdough bread and some Foggy Knob Farm butter. If you’ve tried this recipe, comment below and let me know how you liked it and what you might have changed. I love sharing recipe tweaks and ideas. Stay tuned for more lamb soup recipes in the next few blog posts. I love making broth. It is one of my comfort foods. A cup of broth always soothes my stomach and makes me feel good. And as the cooler weather approaches, Lamb Sipping Broth is particularly satisfying. Bone broth is renowned for it’s healing properties. With lamb's rich array of nutrients, it is particularly well suited for making bone broth. Lamb Bone Broth is high in tryptophan. Tryptophan helps regulate serotonin, one of our brain’s “feel good” components. Sipping on Lamb Bone Broth makes you feel calm & content. Lamb Bone Broth is high in zinc. The easily absorbed zinc in Lamb Bone Broth supports heart, bone, and hormone health. Lamb Bone Broth is high in gelatin, collagen, hyaluronic acid and other skin and hair healthy nutrients. It helps to keep us looking young and vibrant. Lamb Bone Broth is rich in glycine & proline. These two amino acid promote joint and gut health, making it essential for those suffering from chronic inflammation & autoimmune diseases. Here’s how I make my Lamb Sipping Broth…. Thaw a package or two of lamb bones** then spread them out in a roasting pan. Toss or drizzle them with a bit of olive oil or ghee and roast them in a 425 degree oven for about 40 minutes. After the lamb bones have cooled a bit, place them in a pot and cover them with water. Bring the pot of bones & water to a boil. If there is any foam or scum on the top, don’t freak out, this is normal. Just skim it off and discard it or feed it to your dog. Lower the heat so your bones & water are at a very low simmer. Allow them to simmer for 2-4 hours or longer. I often turn them off at night and turn them back on in the morning to simmer longer. You can simmer them for as long as 8 or even 12 hours if you like. At the start of the simmer, I like to add onion skins and trimmings, carrot trimming, celery trimmings, etc. I keep these in a bag in my freezer just for broths. You can use whole fresh onion, carrot, and/or celery too. It’s all good. Once your broth has simmered for as long as you like, just strain some into a mug for sipping on, then add more water to your pot & keep the bones simmering along for a continuous pot of broth. Or, you can strain all of the broth, cool it, and remove the layer of fat from the top (or not, the fat is very healthy for you!). Then cover the bones with more water and get it all simmering again. You can do this 2, sometimes 3 times to maximize your broth output. Preserving your lamb sipping broth. Your lamb broth should last in the fridge for about a week. You can freeze it too. Just leave plenty of head space in your container as it will expand. Sometimes, I concentrate the broth after straining it. To do so, just boil it until the the broth is about ⅓ it’s original volume. Then cool it and pour it into ice cube trays and freeze them. After frozen, pop them out and place them in a plastic ziploc bag and keep it in the freezer. When you want a warm, soothing mug of Lamb Sipping Broth, you can grab a frozen cube, add ⅔ cups of water, and heat it in a small pot. Pretty simple, isn’t it? You can flavor your lamb broth (and add more healing goodness too!) Here are a few ideas…. Add sprigs of rosemary, thyme, some black pepper, and garlic during the last 30 minutes of simmering. Add a dash of lemon juice and salt just before sipping. Saute a pinch or two of curry powder in some Foggy Knob Farm ghee for a minute and add the spices & ghee to your mug of lamb broth. Curry goes well with the flavor of lamb. Shred some fresh ginger root and garlic into your mug of broth. This gives your broth a nice, spicy, warm flavor. It is great pick me up on a cool Autumn a afternoon! Or just enjoy your Lamb Sipping Broth plain with a pinch of good salt. Do you know someone who might benefit from the healing benefits of Lamb Sipping Broth? Forward this post to them so they can learn how! **Foggy Knob Farm’s whole and half lambs include a bag or two of bones. There are neck, soup, & marrow bones to provide the most nutritious and gelatinous broth.